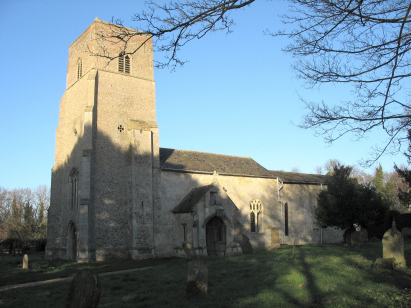 The parish of Little Dunham lies in central Norfolk, the village is north-east of the market town of Swaffham and around 2 m,lies north of the main A47 east-west road linking Norwich to King's Lynn. Little Dunham sits on a relatively high (for Norfolk) plateau of agricultural land being some 80 metres above sea level. The village is centred on the north-south lane which connects the A47 with the large village of Litcham. Most of the village is grouped around a complex of lanes which form an oval to the west of that lane. St Margaret's church is to the west of the village centre and is tucked away up a short narrow lane. 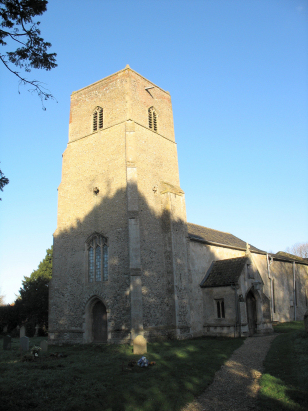 The church is relatively old for a Norfolk church with much that is 13th century. Parts of the doorway and chancel and nave windows date from this early period, however like many churches it is a melange of parts being added, modified and extended over the centuries with Perpendicular and Decorated styles predominating. A single standard 800-entry register book covers the period of the transcript and indeed carries on beyond 1880 to completion in 1902. This register is filmed on Microfilm MF1395 in the collection of the Norfolk Record Office and from which this transcript was prepared. The film is quite a recent filming and benefits from the improvements in image quality which are now achieved being clear and with good contrast as a consequence this was a straightforward transcript to produce. There are gaps in the numbering in the early part of the register this is caused by the cleric starting a new year on a new page - this practice was eventually discontinued and all entry spaces were then used.